Apiguard® is a natural treatment to control varroa mite populations in honeybee colonies. Tests show that Apiguard also helps to control tracheal mites / Acarine and chalkbrood. Ideal in Integrated Pest Management (IPM) programmes. See Apiguard video with Dutch subtitles. And here’s an updated Frequently Asked Questions pdf. 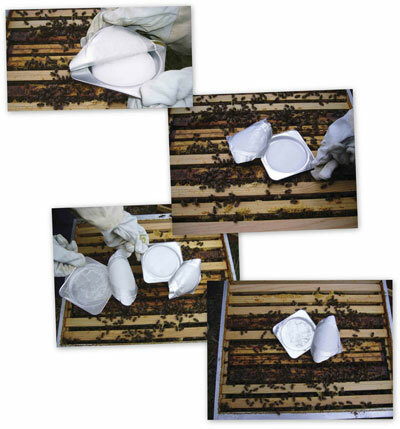 Place the opened tray face upwards in the top of brood frames, preferably centred over the colony. After 10 days examine the tray and if it is almost empty, replace with a second tray. If there is product left in the tray after 10 days leave until day 14 and then replace. Leave the second tray in position for a further 2-4 weeks and treatment has been completed (duration of treatment therefore lasts 4-6 weeks). Apiguard works best in temperatures above 15°C. But it is also effective at lower temperatures even though the gel takes longer to evaporate and the gel needs to be left I place for longer. For the latest detailed update on using Apiguard, see Vita’s latest Apiguard FAQ and video (above). Apiguard is a sophisticated, patented slow release gel that ensures correct dosage of its active ingredient, thymol. 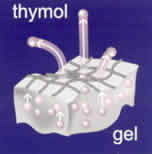 Thymol is a naturally occurring substance derived from the plant thyme. 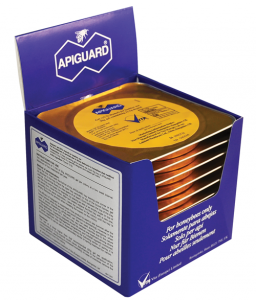 Apiguard gel comes in 50g ready-to-use aluminium trays (two will treat one standard colony). 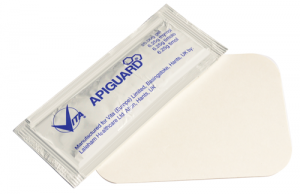 In certain markets, Apiguard is also available in 3kg tubs and 25g sachets. The handy 25g sachet (pictured right) for nucleii, very small colonies and use in hot climates is available in some countries. The 3kg tub, suitable for bee farmers and those with many colonies, comes with dosage tools to ensure correct and easy dosing and is available in some countries. Apiguard has no harmful effect on the honeybee colony: neither on brood nor on adults. In regulatory terms, the EC maximum residue limit of Apiguard has been classified as “No MRL necessary” because of its low toxicity and hive residue profile. Once in place, vapour from the Apiguard gel is given off. Unlike some other formulations and raw crystals, the release from the gel works steadily and does not disturb the bees unduly. Worker bees climb into the Apiguard tray, remove the gel as a hive-cleaning behaviour and distribute it throughout the colony. The gel sticks to the bees’ body hairs and, as the bees move through the hive, particles are left throughout the hive. The worker eventually throws out the gel it is carrying, but the traces remain until they too are removed later. Apiguard trials in more than 600 honeybee colonies in 10 countries across Europe, the Middle East and North America have shown it to be a very effective, easy-to-use treatment (even easier than Apistan!). 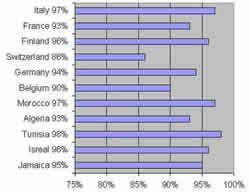 Under normal conditions it gives an average efficacy of 93%. Often the control levels are higher and sometimes a little lower. Safety Data Sheets for Apiguard and Apiguard CS. See Apistan for an alternative treatment / medicine for varroa mites. See Bee Gym for another element of IPM that will help bees groom themselves. See VitaFeed Gold to stimulate honeybee colonies and boost their immune systems. See Vita’s information on the honeybee diseases implicated with the varroa mite (Varroa destructor), chalkbrood, and trachael mites / Acarine.